The choice of the correct location in your garden is the basic requirement for a successful cultivation of daphnes. Location here means, the exposure with duration and intensity, the amount of rainfall and its distribution during the year, the temperature variation, the wind exposition and the soil in its structure and composition of available nutrients and trace elements. Daphnes grow in different habitats. There are species that grow in herb-rich, open woods. Species, that thrive in colline and montane bush vegetation or on alpine meadows with grasses and herbs. But our classic notion includes mostly a rock formation, rough and unreal, from where flourishing life springs. Often it is not the height level, which defines growth; a small amount of precipitation may also be the restricting factor. The most, of the coveted Daphne species growing on very permeable rough-soils as they are existing in the mountains. These soils are stony and have only a low humus layer. The soils are quickly warmed and the little organic material is decomposed fast. If the soil is heavier, then the lower rainfall, or dry seasons characterize the vegetation. With a strong root system and a resting phase, daphnes have adapted themselves to these local conditions. They take the necessary moisture from the depths. Especially, an excessive moisture or wetness at the wrong time, causes rot in the root area and the plant dies (see also section: Pests & Diseases). 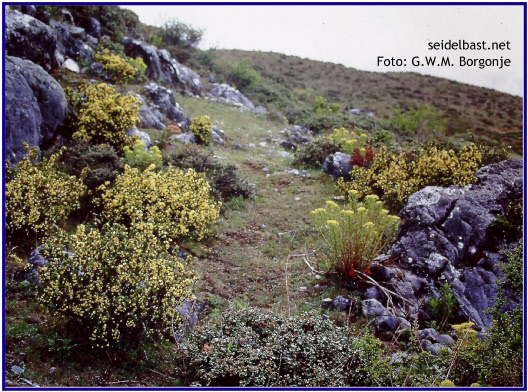 It is the sore point from many mountain plants and also Daphne species and hybrids that they are exposed in their natural habitats a low pressure of fungal infections. The soils have little organic content, dry quickly and the vegetation period is usually short. Thrive to such places is difficult for fungi. The immune system of daphnes is not challenged and the defence capability to fungal infections is therefore not particularly prepared. The German lowlands are dominated by humus loamy soils, brown-soils are widespread. The annual precipitation is about 600 litres or more. Central Europe is a summer rainfall area. 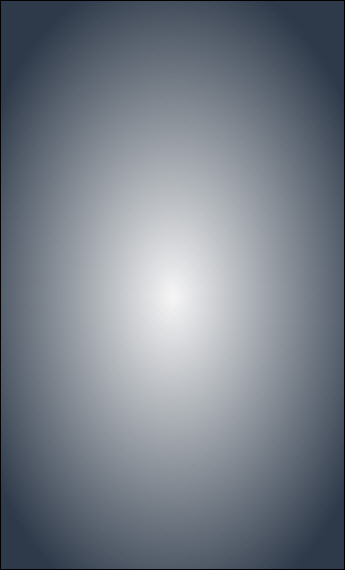 Moisture and warmth are simultaneously present. The more extreme one location, the lower is its vegetation and therefore the organic fraction in the upper soil layer. Nutrients must necessarily be taken from deeper soil layers, and the rooting through the surface soil stays low. For Daphne, this means: The smaller species inhabit mostly extreme locations and often require better drainage than the larger daphnes. Exceptions are some Daphne hybrids whose soil tolerance was already significantly improved by breeding. For the composition of a suitable, permeable soil, there are many recipes. The availability of raw materials and the financial stakes form the frame. Usually is a mixture of 1 part good garden soil or lawn soil, mixed, with 1 to 2 parts grit or gravel (grain size 0.5 to 1.5 cm ~0.2 to 0.6 in), sufficient. Heavy soil or soil with deficiencies must be improved. In heavy soil, peat or compost can be added. This transforms into clay-humus complexes and has to be composted before use, for about two months. Daphne do not like fresh, prepared substrate mixtures. Thomaskali, Algaplant, Agrosil, trace elements or real sea-algae-lime. These substances also have to react and the soil-mix should be stored for four weeks under moist conditions. 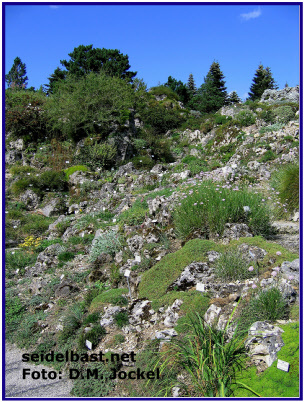 Please note that alpine plants generally require less nitrogen. The content of phosphate, potassium, calcium and other minerals may be somewhat higher. Most daphnes prefer neutral to alkaline soils. The sour-cultivated plants, have wonderful green foliage, but are more susceptible to infection and do not live long. Daphnes can, like other trees also be planted in spring and autumn, but the autumn planting proves to be advantageous. Root formation in the deeper soil layers takes place in autumn with practically no drought stress. 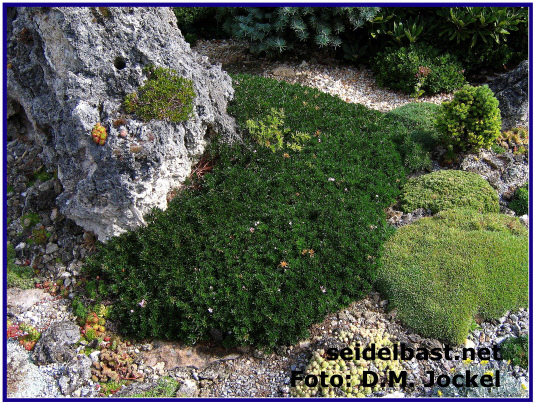 The planting is done for example in a normal rock-garden-bed, raised bed. The depth of the bed is about 60 cm ~23 in , in many cases even more. The planting hole, also 60 cm deep, is filled to 30 cm ~12 in (1-3 cm /~/ 0.4 to 1.2 in grain size) with rock gravel. Then, comes the above-described soil mix with 20 cm ~8 in thickness. Now, put the plant into it and press down lightly. Around, fill the planting hole with gravel or coarse split and then pour. If on purchased daphnes, peat culture substrate was used, carefully remove the peat from the roots. 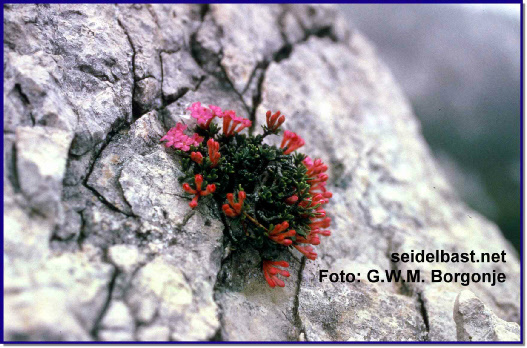 Although alpine plants do not like disturbance in the rhizosphere, the above recommendation is important because the decomposition of the peat substrate leads to decay. Acquired plants should receive a fungicide with the first watering. Also for purchased daphnes-that not yet were planted, has a fungicide application during the first watering proven to be advantageous. In autochthonous cultivation, this is not necessary. Daphnes that are planted in a drained bed do not require fertilizer. Over time they develop a deep root system so that they receive their nutrients, from the existing soil below the drainage layer. Potted plants receive fertilizer. During the growing season the application of fertilizer for flowers (less nitrogen-more phosphorus) is possible, approximately half of the amount that is stated on the pack. To come to rest before there is winter, the last fertilizing should be given in summer. Winter-hardiness is always good for a conversation between Daphne enthusiasts. The hardiness is on one hand species specific and on the other hand depending very strongly on the location and on soil conditions. Not the cold, but the change from warm and cold periods during the winter months represents the real problem in our region. Most of the cultivated daphne plants are hardy, because they come predominantly from the mountain regions. Mediterranean daphnes, i.e. 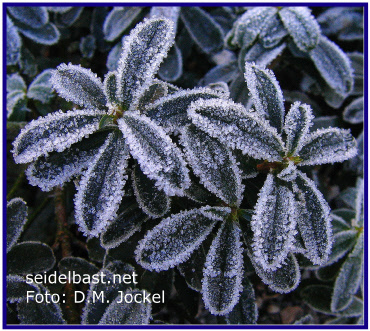 Daphne jasminea or Daphne gnidioides are also familiar with frigid temperatures, but a winter in Germany without protection, they would not survive. For little dubious daphnes a simple wetness protection is sufficient so that rain and snow not fall on the plants. There are always losses, especially with difficult daphne species and hybrids. Naturally, they are rare to obtain. The more important it is to propagate the daphnes from your own plant stock to close the gap again. 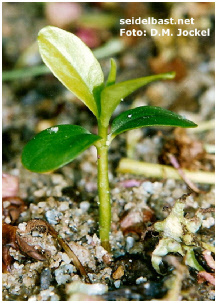 Sowing is the most common method of Daphne propagation. Daphne seeds can nowadays be purchased worldwide. Therefore belong, the self-pollinating Daphne species meanwhile to the most famous of their genus. All daphnes in common, is the natural character. This means, their germination is oriented to the conservation of the species in their natural habitat. 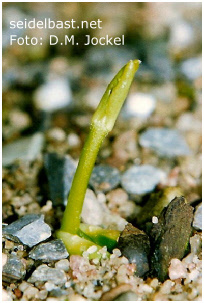 An irregular germination is therefore not unusual. The seeds can germinate in both the first and second year of sowing, or after two years or even later, rarely. The storage life is limited and fresh seed the basis for good germination. There are three different types of seed germination within the genus Daphne. 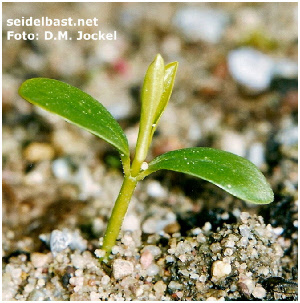 The seeds of Daphne bholua germinate only in the first weeks. This is similar to the native oak. Such an, uninfluenced- or not responsive to circumstances germination behaviour, is called recalcitrant. The second seed type depends primarily on the availability of water. Low temperature fluctuations through the year and a precipitation-controlled growing season set the framework. Daphne rodriguezii and partly Daphne sericea represent this category. But the majority of the daphnes form the third group. Before germination, the seeds must go through a cold period - called stratification. With the rising temperatures of spring the seeds start with germination. 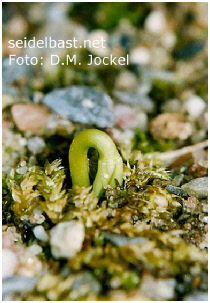 The flowering time of the species is often also the time for their germination. Among this group, belong Daphne domini, Daphne kosaninii, and Daphne oleoides. The seeds are sown in trays or pots, if possible, immediately after seed maturity. The seeds can be freed from the fruit flesh. This reduces the risk of fungal infection. For sowing a commercially available seed compost can be taken, but this substrate has to be processed before use. As sowing substrate serves a mixture of 10 L of the bought sowing soil mixed with 5 L of clean sand (medium coarse) and 2 L grit (grain size about 0.5-1 cm ~0.2-0.4 in). The recipe is modifiable, but care must be taken that a relatively permeable substrate is formed. Is the seed pot filled with the substrate, comes on top a 2 to 5 mm (~0.08-0.2 in) thick layer of sand. The thickness of the sand layer depends on the seed size, because in the sand, the Daphne seeds are embedded and pressed lightly. Finally, there is a covering of the seeds with sand (coarser grain) or grit. The coarse cover prevents algae growth and reduces the formation of moss on the seeding pots. It is advantageous to suspend the sowing to the weather (snow and frost), for at least eight weeks. Germination can take place at the end of winter in a cold frame or greenhouse, but watch out! Particularly important now is the temperature gradient. If the temperature rises in the seeding pots too high or the night temperatures fall not sufficiently, evaluate the seeds this as a signal for summer and terminate the germination, in the worst case shifted for next year. 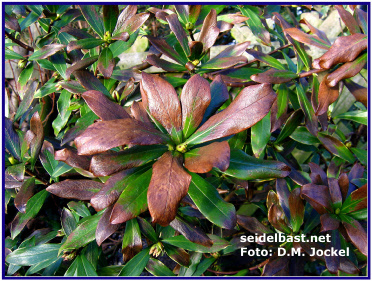 Substrate-day temperatures of 20 to 25 ° C and substrate-night temperatures below 10 ° C for example, offer good framework conditions for Daphne giraldii. When the germination took place and the seedlings have formed their second pair of leaves (see right picture above), they can be potted. The substrate mixture for this purpose may contain more humus than the above-mentioned mixture (Plant & Care). This makes the rooting easier and encourages growth, but make sure that no water-logging occurs. With the generative reproduction and the subsequent culture period it takes up from three to four years for the first bloom. Faster it goes in vegetative propagation with cuttings. The propagation of cuttings, offers the advantage that the plants after one to two years are strong enough for flowering. With the constantly increasing interest in daphnes and particularly the attractive Daphne hybrids, the cuttings represent the most important method of propagation. The non-self-pollinating Daphne species and many hybrids produce scarcely or no seed, and can only be propagated vegetative. 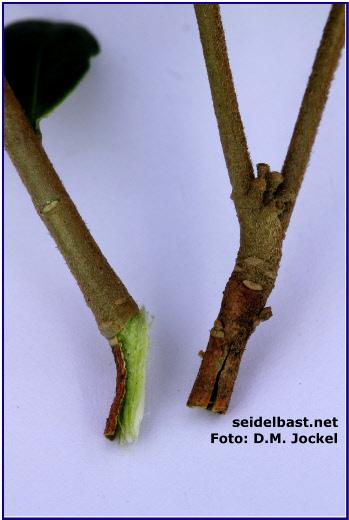 The Daphne propagation with cuttings runs basically according to the same pattern, as with other woody plants. The not always pronounced willingness of daphnes, to form roots, requires in the procedure, a higher level of care. It is possible both in summer and autumn to make cuttings. June-July and September are the best months. Summer cuttings need six to eight weeks to form roots. Then can be planted in pots. Autumn cuttings need longer time and potting can only be made at the earliest in spring. When, the respective Daphne species or hybrid after flowering goes into a short resting phase, is the ideal time to take cuttings. There may be no leaves on the shoot tips in growth. There are two different methods to produce cuttings. The first method creates tear off-cuttings. A small branch is torn off from the shrub but carefully. With the second method a cut is made with a sharp knife or razor blade and these are normal cuttings. In both procedures should always be at the base of the cutting, a little part old wood from the last year's growth. To enlarge the wound surface, a incision can be made, about 1 cm deep at the base. A removal of the lower leaves avoids the leaf contact with the substrate and reduces the risk of fungal infections. A dipping in rooting hormone before the cuttings are inserted is possible but not necessary. The cutting substrate may be a similar mixture as the above seeding substrate. Organic ingredients and moisture can quickly lead to rot, therefore inorganic substrate is nowadays preferred. Vermiculite and pumice in 2-5 mm (~0.08-0.2 in) particle size has proven itself. Not each, pumice is the same. Apparently are the nutrients or trace elements in the corresponding mixtures of greater importance, because otherwise, some successes or failures, can hardly explained. Therefore also applies the simple cutting rule: Insert the cuttings into the same substrate wherein the mother plant grows well. After insertion, is poured with a fungicide solution. The rootless cuttings should not lose turgidity. An off-sun-protected site for the next few weeks is mandatory. Not the substrate moisture is allowed to be high, but the humidity. Damp, unvented conditions must be avoided, otherwise occurs decay. For those who cannot meet these needs in summer, offers the autumn the time to make Daphne cuttings. In the first step of the rooting process a callus will formed on the wound surface. In the next time will grow the roots from there. At first they are still white, later, develops the brown root bark. If a portion of the root has its brown colour, the cuttings can be potted. Generally takes the rooting of Daphne-summer cuttings about six to eight weeks. The critical phase in the culture is at the beginning until the callus has formed. 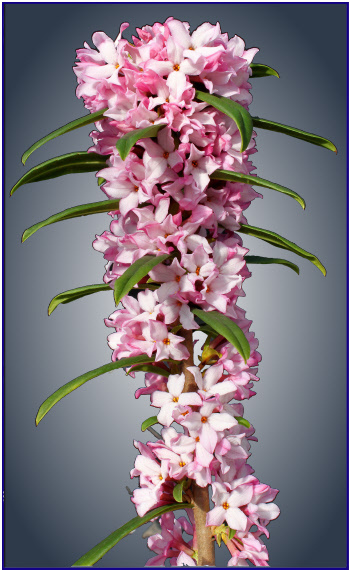 The decisive factors are the growth conditions, but essential is also the selected Daphne species. Not every daphne is equally accessible to the propagation of cuttings. For example, are Daphne arbuscula ‘albiflora’ or Daphne malyana highly stubborn in the propagation of cuttings. These hardships are propagated by grafting in practice. Whenever a daphne is threatened to die, is grafting the method of choice to salvage what can be saved. As rootstocks serve daphnes, which are present in sufficient numbers. In Great Britain they take, Daphne retusa or Daphne tangutica, in the Czech Republic Daphne giraldii, Daphne acutiloba and Daphne longilobata in the U.S.A., and in Germany Daphne mezereum. It is also possible Daphne pontica, and Daphne x rossetii was previously used. Rootstock and scion should have approximately the same diameter. It is easier to bring together the equivalent tissue structures. 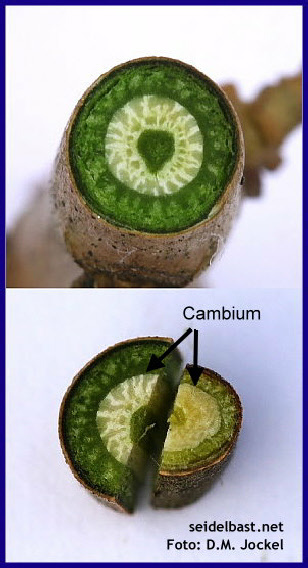 The growing together comes from the cambium (dark green area in front of the bright centre). The green areas beneath the bark must be made to coincide, so that the grafting can succeed. Important then is not a strong pressure with brackets or bands, but to remain in good contact, so that the thread of water is restored. The scion must quickly restore the water stream, or there is too much air in the vascular tissues and the water transport driven, by the transpiration breaks off completely. Everyone knows the problem of cut flowers that must be cut again if they did not stand in the water for a while. A wrapping of the graft with tape (Parafilm or Medifilm) closes airtight. Previously, a drop of a very diluted solution of cytokine pour in with a syringe. Directly absorbable moisture, as well as growth stimulation are now available. A regenerated water flow and stimulated cell growth help to avoid failures and lead to faster results. 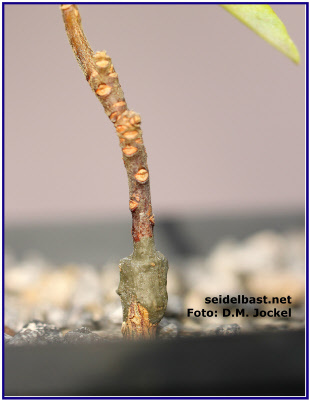 Until rootstock and the scion are grown together, they have to be cultivated at a protected place with high humidity, to prevent from unnecessary transpiration. After the grafting is grown together, insulate the connection with tree-wound balm, to keep away moisture and germs. Scion and rootstock grow together within four to six weeks. Although this sounds simple and effective, it is not true, as the Daphne mother plant had to be cultivated over many years. The next opportunity to take cuttings from the mother plant is often several years later. The most coveted, and slowly growing, and in our climate partly sensitive Daphne species require care. Mother plants which are serving for propagation are always under observation, so that pests and diseases can not destroy the result of years of work. Daphnes, that are not growing in their natural habitat, for that they have acquired, during their evolution, all the necessary abilities to thrive, are facing new challenges in our gardens. It is up to us to try to cultivate them according to their needs. The fence here is just a line in limitless togetherness of nature. Depending on the surrounding, which adjoins the garden, occur insects that leave their tracks on the shoots of daphnes. Besides the ubiquitous aphids, grasshoppers and crickets, earwigs and cicadas should be mentioned. 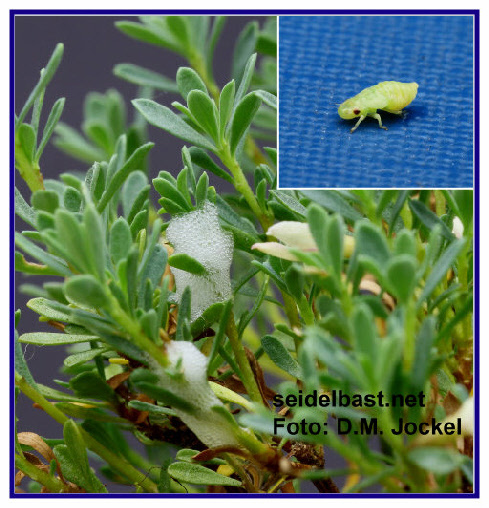 The right picture shows the cocoon of a foam cicada on Daphne jasminea. Commonly these foam cocoons are also called cuckoo spit. 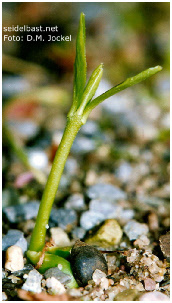 Affected are the soft shoots or buds. Often the lesions are irrelevant and wiping off or collecting is sufficient in most cases. 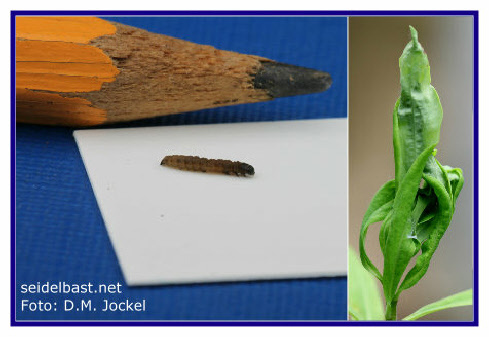 By contrast, the larva of a inconspicuous moth has a greater potential to cause trouble. For their own protection, stick the larvae the outer leaves of the shoot tips together. Inside these cocoons, they eat the new, young leaves. Affected are the soft leafy Daphne species, but even before Daphne odora and Daphne cneorum they do not stop. It is difficult to collect, the larvae out of their leafy castle, without damaging the shoots. The excrements from the digested leaves inside of this structure turn very fast into a breeding ground for fungi and bacteria. With a systemic insecticide, the infestation can be stopped. Only one pesticide is not enough when an infestation with the red spider mite took place -below right picture. Even in old textbooks of pesticides, is recommended, with an infection of the red spider mite, the alternating use of several pesticides, because of the fast developing resistance. Fortunately, the red spider mites cause problems almost exclusively in the greenhouse. The leaf surfaces have a silvery shimmer, because the cell sap was sucked out. The undersides of the leaves are full of brown-red mites and black excrements. An ideal environment for further infections. Sucking parasites can also carry diseases (vectors). The infested daphnes try to protect themselves by dropping the leaves, in order to deprive the parasite of his food source. Several months’ growth may have been in vain in a short time. Acaricides and systemic pesticides are applied during the growing season. In winter and early spring, under an overcast sky, is, the as a spray used emulsion of rapeseed oil, the best choice. Here there will be no resistance, because the oil surrounds the tiny mites, and they suffocate. An addition of neem oil expands the spectrum of activity. The Daphne foliage is covered here for nearly a week by a thin film of oil, which restricts the transpiration, and this causes an overheating during sunshine. Therefore apply only in case of bad weather periods. Do not use the rapeseed- neem oil mixture on Daphne petraea. This Daphne species is more sensitive than it looks. What really worries in our warm, humid summers, are the infections with fungi. 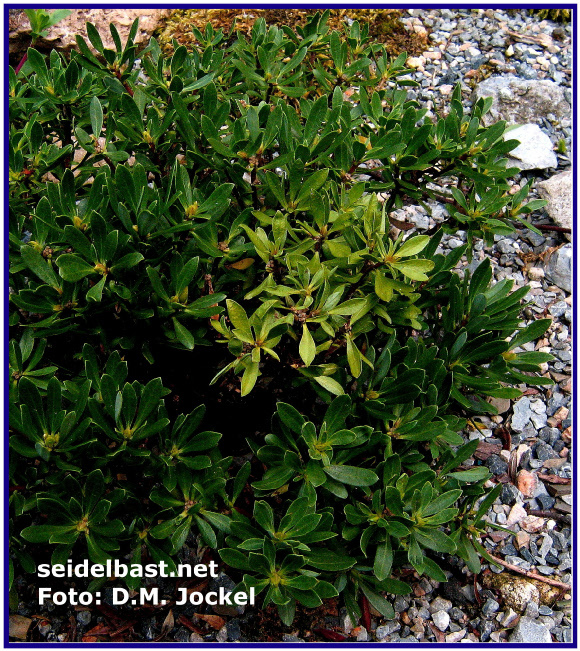 The DSDS- Daphne Sudden Death Syndrome, or just called sudden death, causes many losses in the genus Daphne. Responsible for this are fungi such as Thielaviopsis, Rhizoctonia, Phytophthora- or Phytium species. Mostly, the cause is an inadequate drainage. Accumulation of old leaves at the base of the trunk and too little air movement are breeding grounds for Botrytis and Armillaria. If the roots are dying, the leaves begin to wither. Shows the whole Daphne plant turgidity problems, most help comes too late. Wilting only the leaves of a single branch, there is still hope, by immediate use, with a suitable systemic fungicide. A long lasting period of summer rain, where dry off is impossible, leads to losses at potted plants and well-planted daphnes to their limits. Rarely a pre-damage can be seen, as in the right picture. Especially with plants in pots, it makes sense, to take preventive measures, before humid weather conditions. A suitable fungicide to the pathogen has to be here not necessarily systemic. When pouring with this fungicide solution over the plants, it penetrates into the soil where it also temporarily develops its effect. The fungicides are sometimes organic metal compounds. To prevent damage by over-supply of a "trace element", change the products occasionally. Finally, the viruses should be mentioned as pathogens. Different types of viruses with a non-specific host range can infect daphnes. Circular bright spots on the leaves and premature, leaf fall is only one type of damage, for an infection. Antidotes do not exist. The infected plants must be removed immediately from the garden. Daphne mezereum, Daphne jezoensis, and Daphne odora are susceptible to virus infection. In the commercial propagation in Asia and the U.S. this problem is known. A clean work environment for the proliferation and the reduction of parasites, that can spread diseases, serve as preventive measures to protect the own plant stock. Ultimately it is the nature that opposes every enemy with an adversary. The natural processes are determined by coming and going. If you want to cultivate the beautiful and rare plants in your garden, then are, sitting, seeing and thinking, the most important activities. A happy gardener learns from his mistakes. May your plants thrive always well! On the next page you will find literature references on Daphne. Finding the right degree of the drainage is dependent on the species and the location. 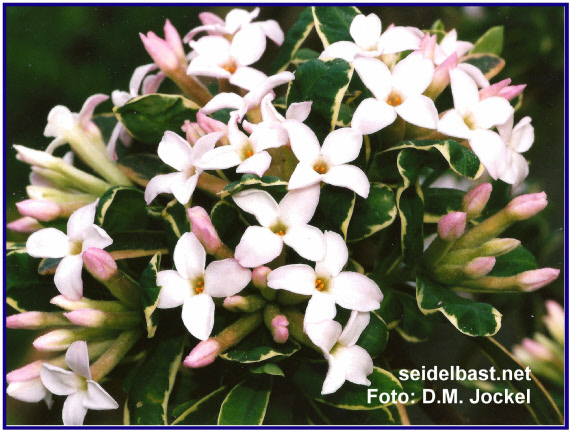 The image on the left shows twice Daphne arbuscula. At the foot of the stone has been developed an over one-square-meter carpet of Daphne arbuscula. On the stone, in the same period, achieved the same species, the size of only a small plant of 20 cm in diameter. In this sense, a perfect drainage is the best possible balance between drainage and supply of water and plant nutrients, which allows optimum flourishing. The structure of a drained soil must comply with the species-specific habitat requirements. A deep-reaching root system form most of the daphnes. 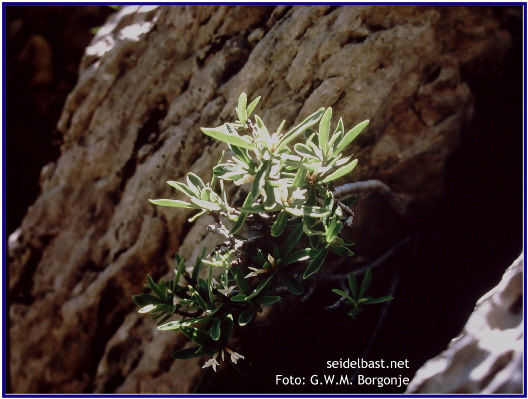 The roots of Daphne alpina, the Alpine-Daphne, serve as an example (see below-left picture). The special feature here is not the root length. Noteworthy is the uppermost horizontal root branching to the right. This little branched root system grows through the thin humus layer of mountain-soils in search of nutrients. Currently there are only a few Daphne hybrids, like Daphne x pontica-hybrid, Daphne x burkwoodii and some other hybrids with Daphne caucasica as parent plant which can thrive under these conditions. A successful cultivation for most of the daphnes is only possible in the permeable soils of rock gardens. Even if the hardiness is given, has the winter sun the ability to cause damage, during frosty winter periods without snow. 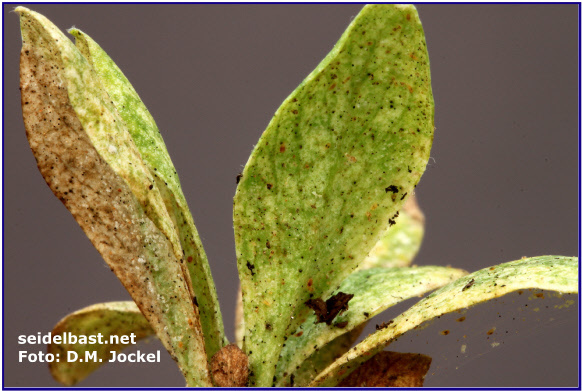 The picture on the left shows frost drought damage on the variegated form of Daphne odora. The normal Daphne odora, right picture, is considered to be non-hardy. 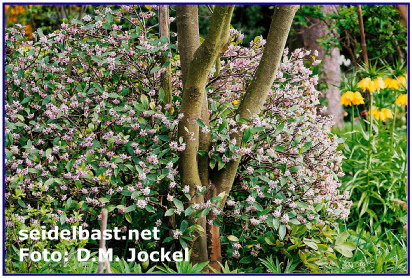 In the vicinity of Maastricht, this Daphne species has many winters survived well, without any protection. Daphnes are not among the preferred food plants of snails. At bud break, in early spring, on young plants and buds, they may be noticeable. Although snails are extremely slow, it is hard to stop them. A scattering of the known agents, even on frost-free days in March, limits fairly well their presence, until the middle of summer.